Engage your students in authentic learning! By checking the box you are giving Performing in Education, LLC consent to use your information you provide on this form to not only invite you to the webinar but follow up with you once the webinar is over. You can change your mind at any time by clicking the unsubscribe link in the footer of any email you receive from us, or by contacting us at training@performingineducation.com. Why project based learning is an engaging way to teach your standards. Which elements of project based learning are essential for success, and how to actually implement them in a real classroom. Actual classroom examples included! How to simplify planning to make this an easy transition for you, the teacher. The importance of collaborating with other teachers, locally and online. How to organize it all in a simple manner. What an entry event is, and how it gets your students excited about the learning. April Smith is a teacher, blogger, author and lover of all hands-on teaching methods. 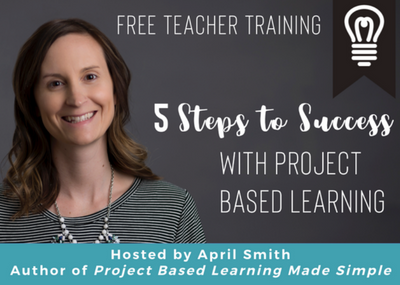 She began using project-based learning in her classroom in 2011. As she learned more about the methods, she began merging activity ideas and the different parts of PBL to bring authentic learning experiences to her students. She began integrating standards and creating structures that allow students to have voice and choice while maintaining order.